Australians love L.A., and the opposite seems to be true as well. The mutual attraction might have begun in 1986 with the hit movie, Crocodile Dundee starring Paul Hogan, and the follow-up in Los Angeles. More than 25 years later, most people here in L.A. still think that Australians drink a lot of Foster's Lager! In 2010, Australia was the number one source of international visitors to Los Angeles*. Granted, volcano eruptions in Iceland that year prevented many Europeans from visiting Los Angeles, but it didn't block visitors from other locations like Canada, Japan, China and Mexico. Neverheless, with a population the fraction of many other countries, Australia outpaced them all! Let's turn Hollywood Boulevard into Little Australia! 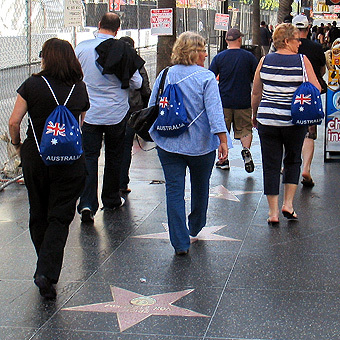 It's cool to see so many Australians walking on Hollywood Boulevard with either "AUS" in big letters, or an Australian flag on your backpacks and jackets. So when you come here to Los Angeles this summer (that's winter for you guys! ), be sure to show your colors! 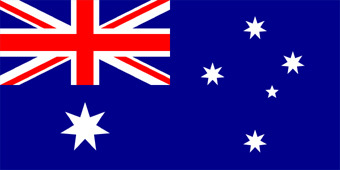 Let's see those Australian flags and AUS letters, especially on Hollywood Boulevard. Let's turn Hollywood Boulevard into the unofficial "Little Australia" of Los Angeles!